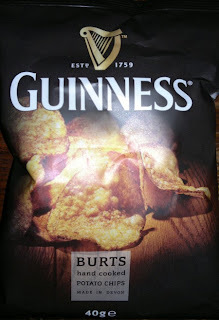 It's about time I reviewed this new remarkable offering from Burts: Guinness crisps. They do have a rather curious, grey-brown colour. (I suppose black would have been a step too far.) 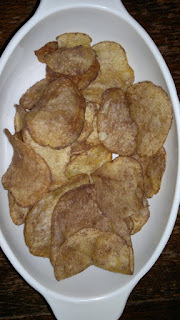 Yeast extract, as you might expect, is a prominent flavour note, so these are ideal for Marmite fans, but there is a very definite otherness about these crisps. They taste dark and stouty. Sort of. Very tasty, with a touch of bitterness. I've had a couple of packs, and if I see them again I will definitely be tempted to purchase. Consider that a recommendation, but your taste buds may vary. Remember, kids: eat crisps responsibly.